The illustrator from the American version of Harry Potter, Mary GrandPré, revealed that she was not hired to draw the franchise’s logo, but she ended up creating it by chance. She asked the creative director of Scholastic publisher, David Saylor, if she could try lettering Harry’s name in the gap she had allocated for the title. That’s how the iconic image was born and it became so successful that was then adopted by Warner Bros. Pictures and publishers around the world. 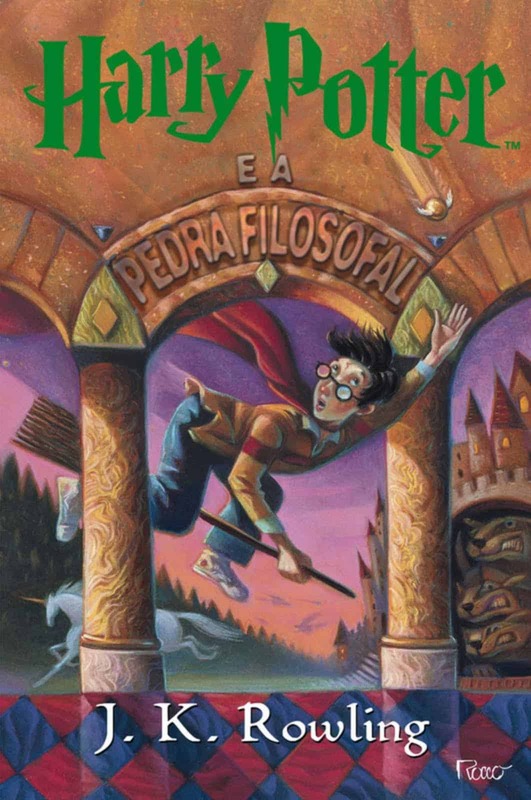 Among other curiosities revealed about Philosopher’s Stone‘s cover to the North-American magazine Entertainment Weekly, the illustrator mentioned the absence of Ron and Hermione not only on the cover but also in the whole book. There is no illustration of the duo on the first volume. “Maybe there was just so much juicy stuff happening in all the chapters, we just never quite made it to them visually. Maybe Ron and Hermione are just too normal!”, she explained. Another curiosity is the change they almost did in the book’s title. From the original British version, The Philosopher’s Stone, the book could have been released in the United States under the title School of Magic. The goal was to have the attention of the American children, which, according to Scholastic, would not feel attracted by the original title.